This Eden point was found on the Finley bison kill site in Sweetwater County near Eden, Wyoming sometime in the 1940's. It's very well made with uniform collateral pressure flaking and a diamond cross-section. The point has a burin type break from an impact. This Eden point dates to the Paleo-Indian period and it was probably propelled through the air with a throwing stick (atlatl). It's made from a semi-translucent dark amber colored chert and measures 3 9/16 inches (9 cm) long. The Finley site is a Paleo-Indian bison kill site. It was discovered in 1939 by O.M. Finley. Various excavations of the site in the 1940's produced 24 projectile points. Six were classified as Scottsbluff points, and eight as Eden points. One complete Cody knife was also found. The Finley site is located in a large sand dune field and evidence shows that it was once used as a sand dune trap by Paleo-Indians. Two different kinds of extinct bison were found in the bone bed, B. bison antiquus and B. bison occidentalis. Approximately 58 bison are represented and they were apparently killed in midwinter. Eden points were first discovered in Yuma County, Colorado blow-outs during the 1930's but none were found in situ until the spring of 1940 when Harold J. Cook spent several days digging in a site discovered by O. M. Finley. The Eden point was named by H. M. Wormington after the town of Eden, Wyoming. The Eden type site was named the Finley site in honor of O. M. Finley who discovered it. Eden points are one component of the Cody Complex. 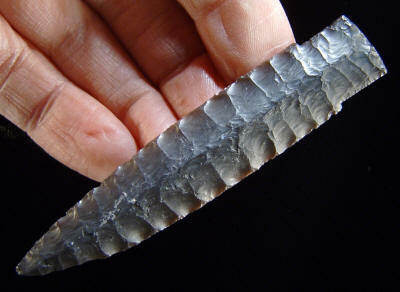 An estimated age for these spear points is somewhere between 9,000 to 8,500 years ago. They are found from southwest Texas to northwest Wisconsin to eastern British Columbia. Eden points are known for their exceptionally well done parallel pressure flaking and diamond cross-section. The people that made them were hunting large animals like bison.